On June 5, 1977 the Portland Trail Blazers defeated the Philadelphia 76ers to win their first and only NBA Championship. The next day, two hundred and fifty thousand fans jammed downtown Portland to celebrate in what remains the largest public gathering in Oregon history. A good social disease known as Blazermania and an electrifying community energy known as Rip City had overtaken an entire state. Edited by Matt Love, Red Hot and Rollin’ features some of the state’s finest writers including contributions from Gina Ochsner, Jeff Baker, Brian Doyle, Dwight Jaynes, Melissa Madenski, Michael O’Brien, Carla Perry, Bob Robinson, Tom Webb, Billy Hults, Bill Rhoades, Matt Love, Walt Curtis, Larry Colton and Dr. Cameron Bangs. 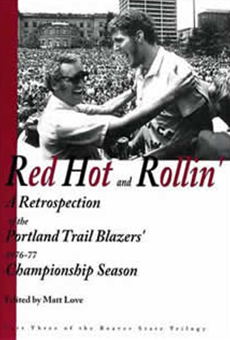 The anthology also contains over fifty previously unpublished photographs of the Championship Season, a fascinating oral history from Blazer legend Maurice “The Enforcer” Lucas, and information on how to download audio clips of radio announcer Bill Schonely’s broadcasts of classic 1976-77 Blazer moments, and a DVD of Don Zavin’s legendary 1978 film documentary on the team, Fast Break, that showed for one week in Portland nearly thirty years ago, and then disappeared from public view. Until now.